If you ask my kids what they’re favorite dessert is they will tell you, hands down, it’s dirt cake. I don’t tell many people this fact because I get paid to bake yummy desserts with unique flavor profiles and, at the end of the day, my kids prefer boxed pudding and Oreos all crushed up together with some gummy worms slapped on top. So that’s a little embarrassing. But, if you can’t beat ’em… join ’em. 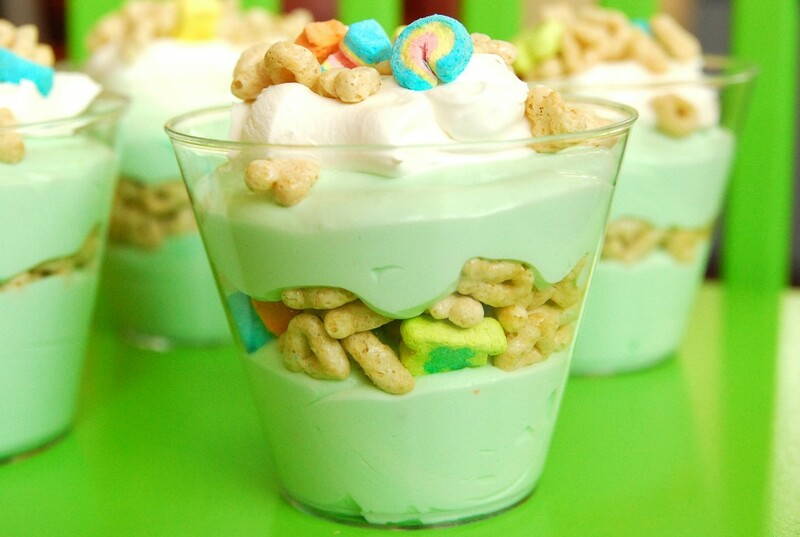 For St. Paddy’s day I thought I’d surprise them with a green version of their favorite snack. The “dirt” for this cake is Lucky Charms, and I used pistachio pudding mix for the green layer but, never fear, I doctored it up so the end result is anything but nutty. You can make these a day or two ahead of time and they won’t get mushy. Just cover and chill them and they’ll be perfect for your lucky day! In a stand mixer, beat together the yogurt, pudding mix, and milk on medium speed for two minutes. Add approximately 6 ounces of the whipped topping (you just need to save about 1 cup of the whipped topping to finish off the tops of your dirt cakes) and beat until the mixture is smooth. In a small bowl, melt the white chocolate chips in the microwave in 30-second bursts, until melted. White chocolate can be a little finicky when melting, so go in small spurts. And don't worry if it's not liquid-y and pourable -- it will still work. With your electric mixer turned on, slowly add the melted chocolate chips into your creamy mixture until well-beaten. Tint with green food coloring, if desired. 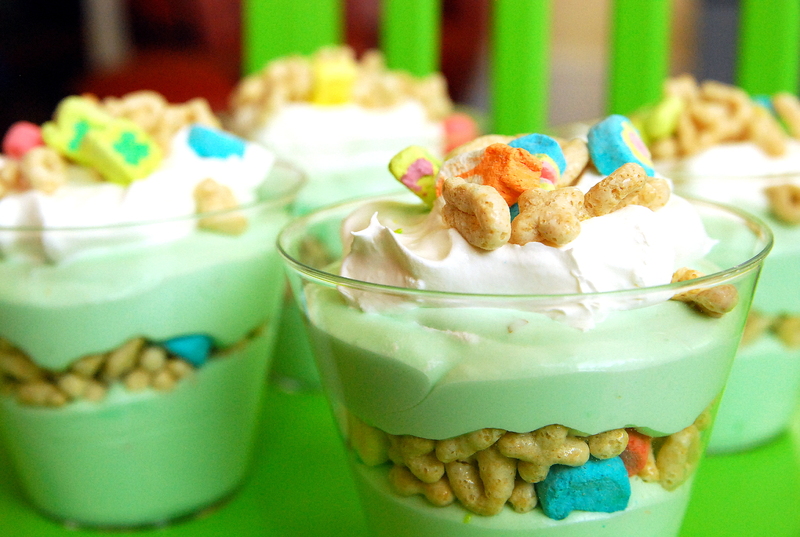 Spoon several tablespoons of the mixture into mini trifle cups, top with Lucky Charms, more of the pudding mixture, a thin layer of whipped topping, then sprinkle with Lucky Charms to finish it all off. Serve immediately for or cover and chill!